You Are Here: Home > Why Buy From Carriage? Do You Know About Your Perks? See a pre-owned or Kia Certified Pre-Owned vehicle at one of our other Carriage locations? We will arrange to bring it to Carriage Kia of Woodstock at no additional charge to you! Just give us a call or use the Request Transfer feature on our website. Starbucks Coffee, Tazo Tea, Chai Tea Lattes, and an assortment of healthy snacks. While you wait for your vehicle service. 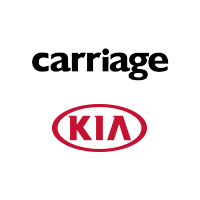 is welcome to Carriage Kia of Woodstock. You can save time by starting your purchase process online from your computer, tablet, or smart phone. Find the vehicle you want on our website and then follow the Explore Payment Options button. You can arrange financing, appraise your trade, and even purchase accessories! When you buy a new Kia from us, you will be able to take a vehicle from our loaner fleet for extended repairs. We offer shuttle service to The Outlet Shoppes and Olde Rope Mill Park so you can relax while your car is being repaired. Bonused on Customer Satisfaction and making sure you get into the right car for the right budget. See us for complete details.